Garden to Cup Organics takes top honors in eleven categories at the North American Tea Championship establishing a multi-year winning streak. Garden to Cup Organics takes top honors in 11 of the 16 categories at this year’s North American Tea Championship. This includes six first place awards, the highest number awarded to a single participating company. The North American Tea Championship is the premier competition for specialty loose leaf teas. It is the only independent competition, judged by professional tea specialists, to distinguish the utmost quality and best tasting teas commercially available in the North American marketplace. 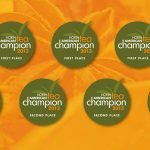 The 2014 North American Tea Championship establishes a multi-year winning streak for Garden to Cup Organics following their nine championship awards received at the 2013 NATC.